Join VINE Sanctuary in welcoming a ragtag gang of goats and sheep recently rescued from starvation. The fluffy flock arrived at the sanctuary on Tuesday, where they were gleefully greeted by sheep and cows, some of whom were positively giddy with the gladness of making new friends. As the newcomers took a tour of the pastures, one particularly self-possessed and curious goat stood out as the leader of the mixed-species group. A black-and-white horned ewe seemed to be her sidekick. Together, they took the initiative to investigate anything surprising that the herd encountered. The whole group seemed remarkably relaxed as they wandered around, trailed by curious cows — as if they knew immediately that they were safe here. Their only moments of nervousness came when Truffles the pig wandered out of the barn, snorting. They didn’t (and still don’t) know what to make of that strange being! 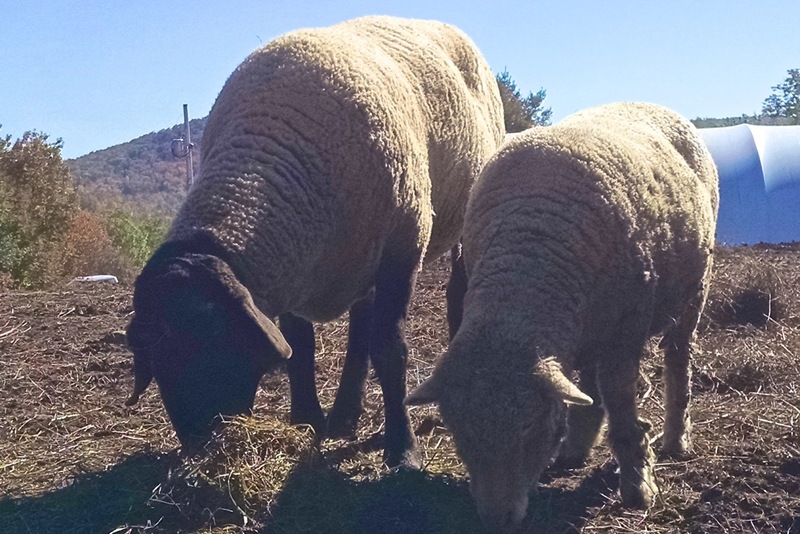 The Mix Mob looks out for its weaker members, who include a bonded pair of 14 year-old sheep, an arthritic elder goat, and a young goat who limps due to an eroded hoof. We’ve already begun managing their pain, and our large animal vet will be making a “farm call” to examine them and work out long-term treatment plans at their earliest opportunity. An anonymous donor who really loves goats and really wants us to reach our goal will match all donations made by October 10!!! Don't Delay — Give Today!! October 11 Update: We raised $800 during the challenge period, and our anonymous donor -- to whom we are very grateful -- had kept her promise by donating that amount! Together, we have raised enough money to cover the Green Mountain Mix Mob's initial veterinary costs, their first month's worth of food, and other costs associated with bringing these scrappy goats and sheep to their permanent home at VINE Sanctuary. We actually raised twice what we hoped to raise during this week-long campaign, and that's very lucky because our initial estimates of the costs of veterinary care and special food were probably too low. In the week that the Mix Mob have been at the sanctuary, we've observed that one additional goat may have arthritis and that the two 14-year-old sheep (the brown pair at the front of the photo below) have some trouble chewing. So, that's one more member of the mob who probably will need medication, and we also will need to special order pelleted feed that can be made into a mush for the elders in addition to the fortified grains we knew we would need to buy. All of which is to say THANK YOU to everyone who contributed to this urgent campaign to welcome a beleaguered but unbroken group of goats and sheep to VINE Sanctuary. Thanks to your generosity, we can buy them whatever they need without breaking our budget! We say it all the time, and it's really true: It takes a community to run a sanctuary. We're so grateful to the members of our extended community, old and new, who stepped up to help our on-site staff meet the challenges posed by the sudden arrival of the Green Mountain Mix Mob! 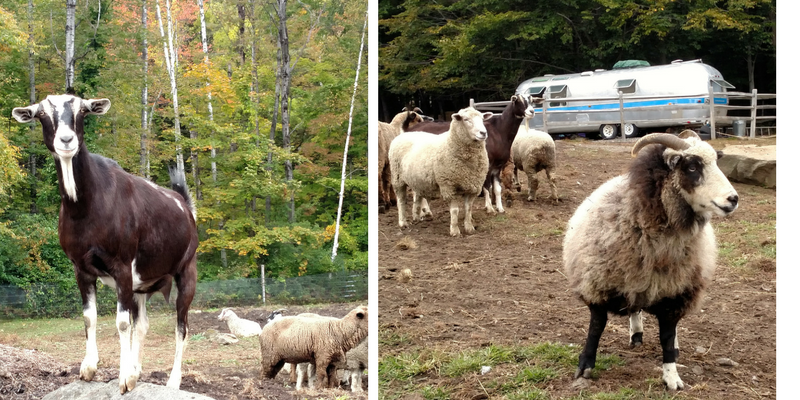 One little ewe from the new crew at VINE Sanctuary already has had a huge impact on our community. The personable ram called Broggy is a favorite of staff and visitors but often causes trouble. Raised as a pet with a calf as his only non-human companionship, he never developed “sheep sense.” While handsome and clever, he is not popular with ewes, and he has not learned by watching Nigel, who has lots of female friends due to the good social skills he learned from being raised by Lamby. Instead, when Broggy wants female attention, whether cow or sheep, he will hound the object of of his affection by dogging her every step, heedless of expressions of disinterest and even after being head-butted away. At night during mating season (which is right now and into the winter for sheep), we have had to keep him penned up for fear that he will harass Lamby or another elder ewe into exhaustion. On their second morning at the sanctuary, we noticed that one of the new ewes had been hanging around Broggy’s pen, seeming besotted by him. As we opened the pen to let him out for the day, she jumped in with him, followed him out, and then proceeded to dog his every step relentlessly. Around and around the pasture they went, Broggy at first seeming flattered and then annoyed by the attention. We laughed and laughed at this surprising turnabout and decided on the spot to call the little ewe Karma. Eventually, Broggy consented to her company. Best of all, now that he has a girlfriend, Broggy seems to be treating the other ewes more politely, so everybody wins! We thank everyone who has already contributed to help cover the costs of bringing Karma and her flock to VINE Sanctuary. We’re just past 75% of the way to our fundraising goal, with only a few days to go. If you’ve not done so yet, please do tell everyone you know about your support for the Mix Mob! All donations before October 10th will be doubled! An anonymous donor will match all donations made between today and October 10!! !